The Secret to Gymnastics Abs ... Revealed! Do you think Olympic Gymnasts are the only ones who can have Gymnastics Abs? 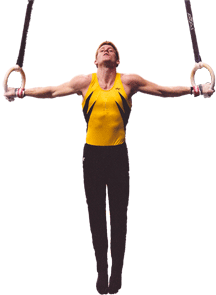 For over 20 years, we have trained as gymnasts, pushing our bodies to the peak of physical fitness. And now, we want to help you achieve your fitness goals! GymABstics is a revolutionary new fitness training program developed by World Gymnastics Team Member Jay Thornton and his brother and National Gymnastics Team Member, Andy Thornton. Through the GymABstics 6-month Training System, Jay and Andy are finally revealing the gymnastics training secrets that make gymnasts the most physically fit athletes on the planet. And the best part ... now ANYONE can perform these exercises and achieve that gymnastics body through the step-by-step GymABstics Fitness Training Program!